It’s that magical time of year and all of us at the Timberlodge could not be more excited. 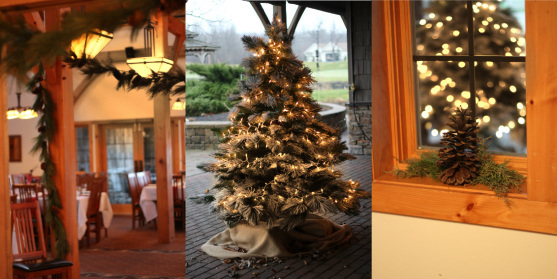 We decided to do some holiday decorating at the lodge to add some wintry touches to to our late November and early December special events. In keeping with the Timberlodge’s understated signature style, we chose a rustic theme using pine greenery, burlap, pinecones, and a few sparkling white lights. We’re just loving the front door swags made of mixed pines, petite pinecones, a burlap bow, and fresh sprigs of berried juniper cut on our very own grounds! Our front doors have never looked more lovely! An adornment for the door is one place many forget to decorate for weddings, but it can have such an enchanting impact as it is the first place your guests can see a display of your wedding style as they are arriving for your special day. The subtle use of burlap and white lights automatically creates a warm and welcoming atmosphere- we use these mediums throughout the year for many of our weddings. Check out all the pretty details below… wishing you the happiest of holiday wishes!